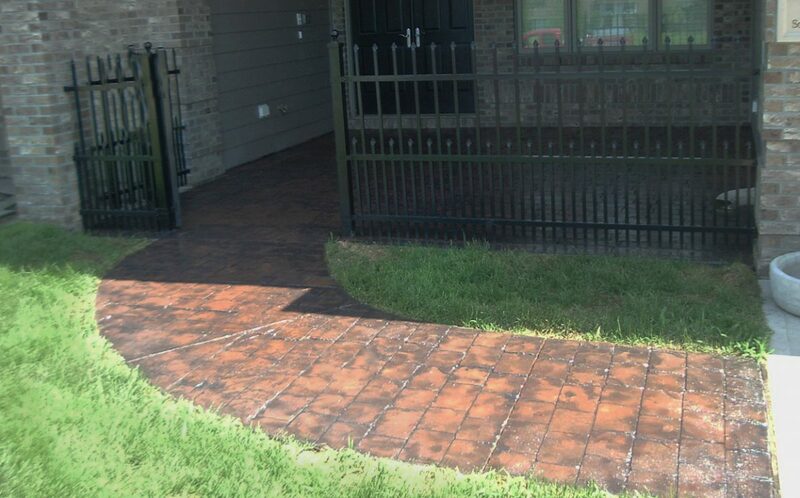 Driveways are our specialty. The driveway is excavated with machinery and the concrete/dirt is hauled off-site. The sub-grade is compacted using recycled concrete as needed. Rebar is an option item added for reinforcing the concrete and helps to give the concrete more structural strength. The driveway is formed to the size and shape of the owner’s specifications. 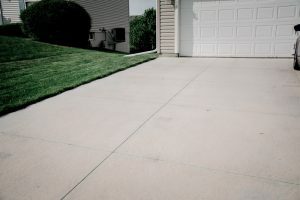 We use a broom finish on driveways for safety. We like to give different depth options for driveways, generally 4” and 5” thick. Patios have a variety of shapes, sizes, colors, and textures. Existing patios are removed either by machinery or by hand depending on accessibility to the site, customer preference, soil conditions etc. Removal by hand costs more due to timeliness and labor. The area is excavated to 4”. The sub-grade is compacted using recycled concrete as needed. 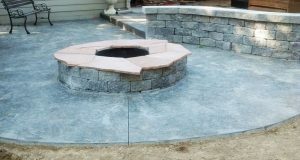 The patio is formed for the size, shape, and color of the owner specifications. Stamps can be used at this point to create texture. Then an antiquing color release is applied. The final step in the process is to cut the control joints, rinse the site off and apply a sealer. Retaining walls can be several different kinds of material. We focus on segmented block for our residential customers. The existing wall is removed by machine and hauled off-site. A recycled concrete base will be placed and compacted. After the base course has been set; a drain pipe will be installed. When needed, geo-grid will be installed to help stabilize the wall. The wall will be backfilled with drainage composite material. After the wall is built; a 4” cap block will be installed for segmented walls. The final step is to grade soil in the immediate area of the wall for proper drainage. We remove the existing stairs. The area is excavated by hand and the concrete/dirt is hauled off-site. Steps usually have a broom finish unless they are stamped and stained or otherwise specified. Steps can be poured different widths, curved or rounded as-long-as they meet the proper width, tread depth and riser height per code. Railings are added after the concrete has cured for a couple of days. This timeframe can depend on temperatures and weather. We remove the existing walkway. The area is excavated to 4″ with machinery and the concrete/dirt is hauled off-site. The sub-grade is compacted using recycled concrete as needed. 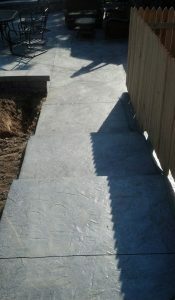 The walkway is formed and poured to the size and shape of the owner’s specifications. Walkways usually get a broom finish, unless they are stamped. The area is excavated. The sub-grade is compacted using native soil as needed. 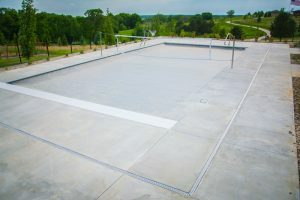 The pool deck will be formed for 4” concrete to size and shape per plan. We finish pool decks with a broom finish for safety. The area will be excavated. The sub-grade will be compacted using recycled concrete as needed. The area will be formed for 5” concrete to the size and shape of the owner’s specifications. The concrete is then given a smooth troweled finish. Then control joints are saw cut. The area is excavated and the sub-grade is compacted using recycled concrete as needed. 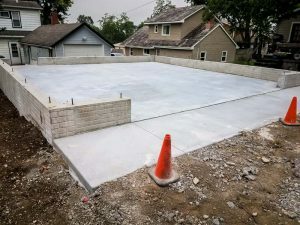 The slab is formed for 4” concrete to the size and shape of the owner’s specifications. The pad will have a broom finish. Finally saw cut the control joints. The area is excavated by hand or machine and the existing concrete/dirt is hauled off-site. A recycled concrete base is used to stabilize the sub-grade as needed. The colored concrete is formed and poured. The pattern is then stamped and an antiquing color release is applied. The following day the patio will be saw cut, rinsed off and a sealer applied. The owner selects the concrete color and antiquing release color before the project begins. The area is excavated. We install a soil stabilizing fabric. Then the sub-grade is filled and compacted using 6” limestone base. 1” of fill sand is installed. Pavers are installed and then the joints are poly sanded. The owner selects the paver and pattern to be used before the project begins. CCD Enterprises would love to answer any questions that you might have. Please feel free to contact us at (402) 896-1497.